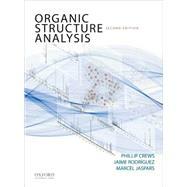 The most up-to-date integrated spectroscopy text available, Organic Structure Analysis, Second Edition, is the only text that teaches students how to solve structures as they are solved in actual practice. Ideal for advanced undergraduate and graduate courses in organic structure analysis, organic structure identification, and organic spectroscopy, it emphasizes real applications--integrating theory as needed--and introduces students to the latest spectroscopic methods. Organic Structure Analysis, Second Edition, is supplemented by an Instructor's Resource CD-ROM , which includes all of the figures from the text in electronic format and the solutions to all of the exercises and problems from the text (in an editable Word file format). FEATURES * Focus on Structure: Opens with structural elements and then considers the characteristics, advantages, and disadvantages of spectroscopic methods. Includes coverage of the steps used in determining a molecular structure, the limitations to organic structure determination by spectroscopic methods, and an "Organic Structure Analyses Gone Bad" table (all unique to this text) * Practical Organization: Presents the most commonly used methods first, beginning with an overview of strategies, followed by the use of NMR, and then moving on to mass spectrometry, infrared, and ultraviolet * Innovative Real-World Problem-Solving Approach: Follows the actual information flow used by chemists to solve molecular structures, as opposed to the standard methods-based approach of other texts * Unique Chapter (12) Featuring 51 Structure-Solving Problems: Each problem emphasizes a different method; the problems increase in difficulty throughout the chapter, successively building on students' knowledge and requiring them to integrate multiple methods to identify molecules. NEW TO THE SECOND EDITION * Coverage of the Latest Instrumental and Computational Advances: Examines the use of modern instruments, data processing, and computer-assisted structure elucidation techniques * Updated and Expanded Treatment of NMR (Chapters 2-5): An extensively revised Chapter 5 discusses multi-pulse 1D and 2D NMR methods, 1D TOCSY and 1D NOESY sequences, and using NOESY and ROESY in determining relative stereochemistry and solution conformation. * Additional Coverage of Mass Spectrometry: A new chapter (7) expands the discussion of mass spectrometry to three chapters (6-8). Topics include cutting-edge MS instrumentation and new information on tandem MS techniques, combining NMR with MS, large-molecule MS, chemo-informatics, and more. * More Exercises and Improved Spectra: The second edition includes 25% more problems than the previous edition (279 total). In addition, many of the spectra, including all of those presented in Chapters 11 and 12, have been reprocessed or reacquired for greater clarity.